Sometimes one wonders about the items we find in the newspaper. There are many references in the Daily Herald beginning in 1935 to something called ‘donkey baseball’. Apparently donkeys were trucked in to the games. A game might go like this: The pitcher throws the ball. 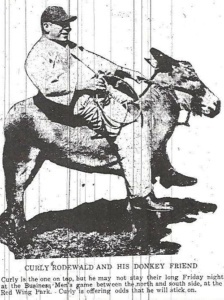 The batter hits it and then mounts a donkey. The donkey walks toward first base. Meanwhile, the shortstop catches the ball, mounts his donkey and throws the ball to first base. The batter apparently is out because he fell off his donkey and then couldn’t get it to move any further. With a little beer the game soon devolves into a state of confusion and laughter. Did these games really take place in Palatine? This entry was posted in sports and tagged baseball, daily herald, donkeys, palatine. Bookmark the permalink.